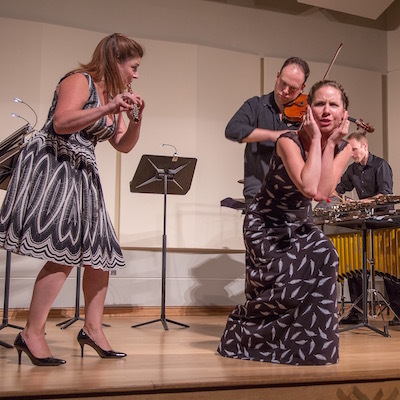 This year the music was exceptionally new, as Wet Ink—so called because the ink hasn't yet had time to dry on the pages of their music—opened our season with Kate Soper's work in progress Ipsa Dixit. And indeed, they were working out new sections during rehearsals! 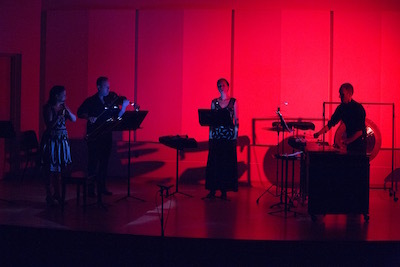 Soper (vocals), Erin Lesser (flutes), Josh Modney (violin), and Ian Antonio (percussion) performed the concert-length work as a dramatic team, moving around the stage (yes, even the percussion), speaking, and reacting to one another. There were duets for Soper and each of the other players and times when all four played. Soper adapted text from Aristotle, Plato, Freud, Wittgenstein, Lydia Davis, and others to create this fascinating exploration of the meaning of language—written, spoken, and sung—and the inherent limitations of any type of communication. While in residence the members of Wet Ink met with New College composition students to discuss the realities of taking works from composition to performance. 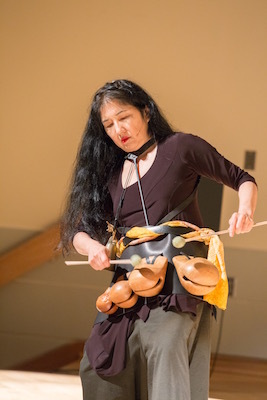 Composer/performer Miya Masaoka came to NMNC to present not only a concert of her works but also a sound installation in New College's Jane Bancroft Cook Library. The concert began with Masaoka walking down the aisle wearing her Percussion Dress, performing Prelude: Hone Music. She then moved to the koto, where she performed Two Women, for koto and vocalizations, and then Fields, for koto with electronic processing. 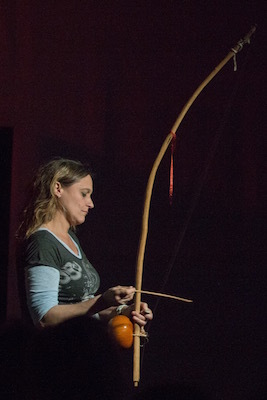 Before the next piece, Stemming ("tuning" in Dutch) she related a story she learned from NMNC audience member Bernard Friedland when they were in the Library installation the previous day. The installation reminded Friedland of how he used to adjust the speed of airplane propellers by "tuning" one to another, listening to minimize the audible beating that accours when two notes are slightly detuned from one another. 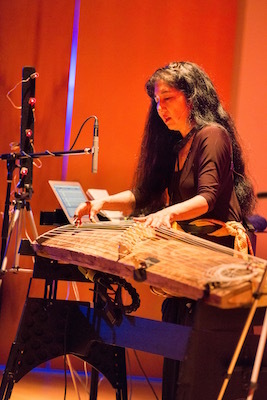 Stemming involves using the koto's resonance to amplify tuning forks held on it, and then processed electronically (which Masaoka described as herself "geeking out"), and difference tones, or beats, are some of the product. When the piece ended Masaoka asked Friedland to come up onto the stage and tell the story in his own words. The final piece was Light Through A Crack, which Masaoka played using her laser-koto, with beams of light acting as virtual strings. The sound installation in the Library was called A Long Way to F#, and involved twelve speakers set ear-height in a circle. Each speaker played a tone a half-step higher than the next (from C natural up to B natural), and over the course of twelve hours the tones slowly converged on the central pitch, F#. People were encouraged to walk—or jog—around the circle, to weave in and out of the speakers, to stay in the middle, and to experience the sound however they chose. The installation, which was supposed to run only for the three days Masaoka was here, proved so popular that we kept it operating for another week. 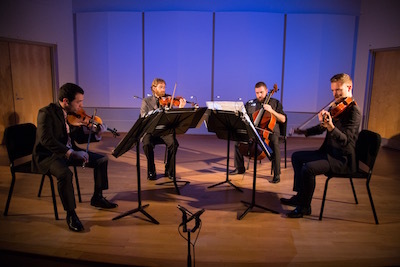 The JACK Quartet opened its fifth—yes, fifth—concert at NMNC with John Luther Adams's ethereal work The Wind in High Places, a three movement piece played entirely using open strings and harmonics. Their second piece was a quartet John Zorn composed for JACK, The Remedy of Fortune. Inspired by medieval music (especially Machaut), the work is almost tranquil, while still containing Zorn's trademark juxtapositions and surprises. Things then got truly medieval with Christopher Otto's arrangement of Rodericus's Angelorum Psalat, composed circa 1390. The concert concluded with the tour de force Tetras by Iannis Xenakis. 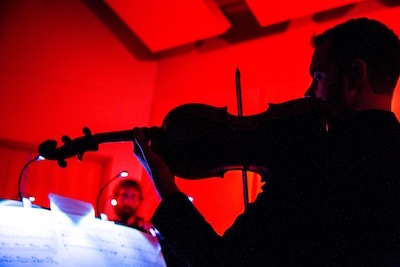 JACK (Christopher Otto and Ari Streisfeld, violins; John Pickford Richards, viola; and Kevin McFarland, cello) brought the audience to its feet with its masterful and explosive playing. You can see videos of both Angelorum Psalat and Tetras below. 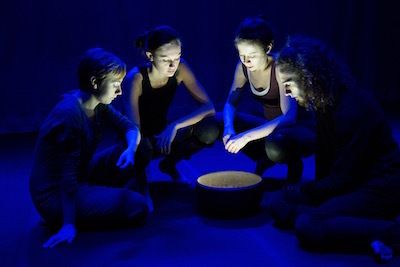 Assistant Professor of Movement and Dance at the FSU/Asolo Conservatory Eliza Ladd worked with New College students Julia Frichter, Alyson Hart, Eugenia Titterington, and Elijah Weiss over the month of January to devise Selfie of the Ancients, an hour-long piece involving movement, sound, lighting, and song. 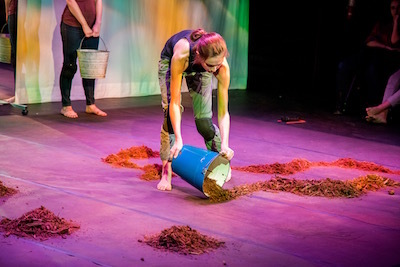 The dramatic work was in three parts and invoked ritual as the performers created sounds by pouring water into vessels or struck the ground with sticks and pieces of iron, and created paths by pouring earth of various colors from pails onto the stage. 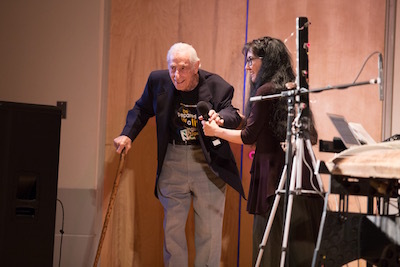 The production was truly a team effort, with the students and Ladd collaborating on the compositions, Edward Cosla doing the sound, Chris McVicker designing the lighting, and Black Box Theater Technical Director Monica Cross as Stage Manager. 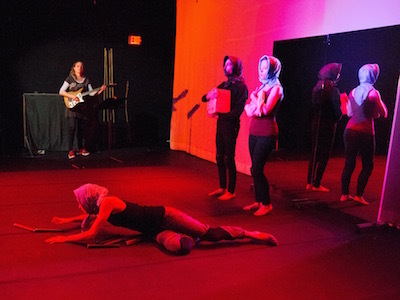 Three performances were given in New College's Black Box Theater. 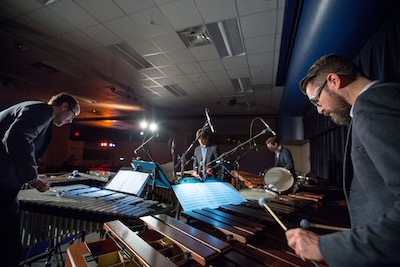 Chicago's Third Coast Percussion returned to NMNC to close out our season, with a wild night at Club Sudakoff. Sean Connors, Robert Dillon, Peter Martin, and John Corkill (filling in for TCP Executive Director David Skidmore, who was called away at the last minute for a family emergency) opened with former TCP member Owen Clayton Condon's Fractalia, an exuberant piece for two marimbas and four sets of tom toms. 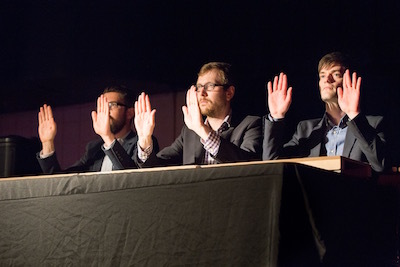 Next Martin, Corkill, and Connors performed Thierry De Mey's Table Music, a wonder of precision played with their hands on tables amplified with contact mics. 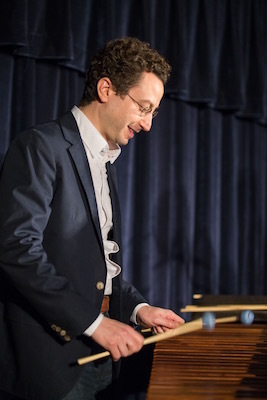 Connors and Martin played Steve Reich's lovely Nagoya Marimbas (video below), and then the quartet performed the quiet, meditative Apple Blossom by Peter Garland. 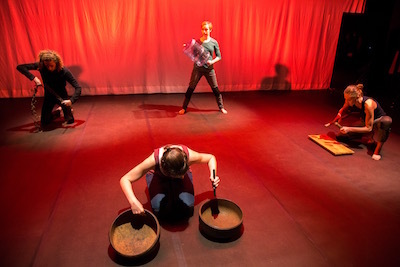 Glenn Kotche's Wild Sound, part 4—a movement of a piece written for Third Coast Percussion—used all the instruments on stage, with the players moving around in a seemingly choreographed dance. Alexandre Lunsqui's Shi followed, with Connors, Martin, and Dillon using chopsticks to play all sorts of kitchen utensils (video below). 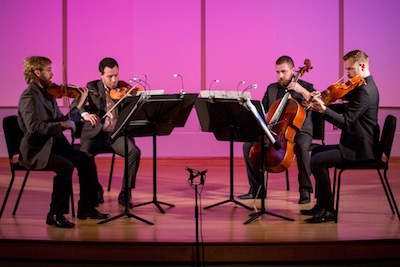 The quartet concluded the concert with Gravity by Mark Mellits, a wondrous and driving piece that elicited a raucus ovation from the audience. 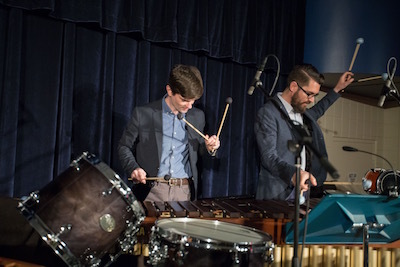 While in residence Third Coast Percussion met with New College music composition students and gave two classes at Booker/VPA High School a demo of several pieces, even leading all the students in a performance of Reich's Clapping Music. Instruments kindly supplied by Florida Percussion Service. Our visiting artists were paid for in part by Sarasota County Tourist Development Tax revenues.